Here are some hints to help you read Arabic calligraphy. Although Arabic calligraphy may not be linear, Arabic calligraphy is legible and is easy to read. Arabic Calligraphic arts are well known phrases. Try to get one word in the calligraphic composition, what you can call the keyword and associate it with well known phrases containing the keyword. Now match one of those phrases with the calligraphic composition. Start from the right side going left, and in most cases from the lower side going up. You will realize that the calligraphic script will unfold itself quickly, enabling you to enjoy the piece of art you are viewing. The Islamic Calligraphic Scripts Medal collection carries calligraphic impressions of some Ayat from the holy Quran and also from traditional proverbs in the Islamic culture. These 35 and 60 mm medals has been manufactured with extra care and attention to detail. They are distinguished by islamic designs and artistic calligraphic scripts. The impression depicted on these medals embossed in relief making it a miniature piece of art. A souvenir medal. (in a crystal clear coin box). The 35 mm size can be presented as a key holder. (with a key holder and a chain, packed in a plastic box). Can be presented as: A paper weight (see different models available in the desk accessories page). 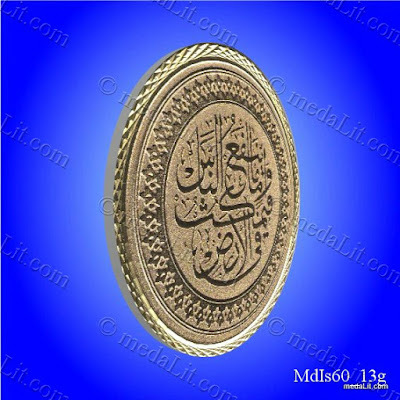 An extra ordinary gift if ordered to be minted from 18 K gold. 35 or 60 mm in diameter. Packed according to customer preference..